Chad Dorr of Dorr Lobster Co. in Milbridge holds up a lobster on Oct. 21, 2012, with one of the company's tags hanging off the lobster's claw. 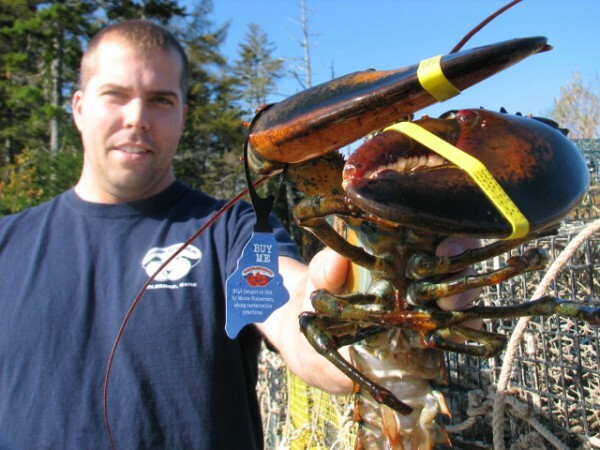 ELLSWORTH, Maine — Maine had another record year for lobster landings in 2012, according to state officials. The price they received for their catch, however, is an entirely different matter. According to Maine Department of Marine Resources estimates, the average annual price fishermen received for their catch in 2012 was the lowest it has been in 18 years. In 2011, the overall statewide volume of lobster landings in Maine topped 100 million pounds for the first time ever, with a total catch volume of nearly 105 million pounds. The preliminary estimate for a statewide landings total in 2012 is 123.3 million pounds, which represents an increase of more than 18 million pounds over the prior year. The dockside value of the estimated 2012 landings is nearly $331 million, which is $3.7 million less than the $334.7 million value of the prior year’s landings, according to DMR officials. “This unprecedented preliminary landings report provides us with both an opportunity and a challenge,” Patrick Keliher, commissioner of Maine Department of Marine Resources, said Friday in a prepared statement. As the economy has sagged, the worldwide demand for lobster has decreased, which has suppressed the price Maine lobstermen have earned for their catch. As a result, lobstermen have increased their efforts in an attempt to make up in volume what they have lost in the per-pound price. In 2011, the average annual price lobstermen received was $3.19 per pound, the second lowest such price they had received in the past 10 years. In 2008, when the economy crashed and the statewide fleet landed nearly 70 million pounds, lobstermen on average were paid $2.93, which is the lowest price they have received since 1998. Those trends continued in 2012. An unseasonal glut of soft-shelled lobsters in the spring and early summer pushed most fishermen to increase their efforts even more. At one point in early summer, the high levels of landings resulted in lobstermen being paid less than $2 per pound for their catch, even though their costs for fuel and bait have remained relatively high. As a result, the preliminary estimate for the average statewide price lobstermen got last year was the lowest it has been for most of the past two decades. Lobstermen were paid on average $2.68 per pound in 2012. The most recent year in which the average annual price was lower than that was in 1994, when the statewide fleet landed 39 million pounds and was paid $2.59 per pound for its efforts. Jon Carter, a Bar Harbor fisherman, said Friday that he never thought he would catch so many lobsters and make such relatively little money as he did last year. He said he did not have immediate access to his personal records, but said his volume went up significantly last year. Still, he added, he’s had a hard time covering his expenses. Bait, for example, cost about $25 per bushel in the Mount Desert Island area this past fishing season, he said. He estimated that price is “probably 10 times higher” than the per-bushel price he paid in 1994. According to the U.S. Energy Information Administration, diesel fuel prices also have increased significantly in the past 18 years. In the fall of 1994, diesel prices on the East Coast hovered around $1.11 per gallon, according to agency figures available online. This past fall, diesel fuel cost more than $4 per gallon. Carter added that he is worried the 2013 fishing season, which generally runs from early spring to late fall, will be a repeat of last year. The recent cold snap feasibly could help avoid another unseasonal springtime glut of softshell lobsters, he said, but he is not optimistic. Many industry officials and experts have attributed the odd timing of the molt, when lobsters shed their shells in favor of larger ones that take time to harden, to warm water temperatures in the Gulf of Maine. DMR still has some dealer reports to collect, so the preliminary estimates are expected to change, at least slightly. Updated figures are expected to be released sometime next month. How to manage the increasing abundance, and the resulting dropping price, will be among the issues DMR officials hope to discuss at a series of industry meetings planned for this month at various locations along the coast. The possibilities of creating a tiered licensing system, reducing waiting periods to get into the fishery and of developing a fishery management plan that establishes “clear goals” for the fishery, also are expected to be discussed at the meetings.